"Très peu distingué" figurait sur le standard de 1954 ainsi que celui de 1965 (FCI/SCC). 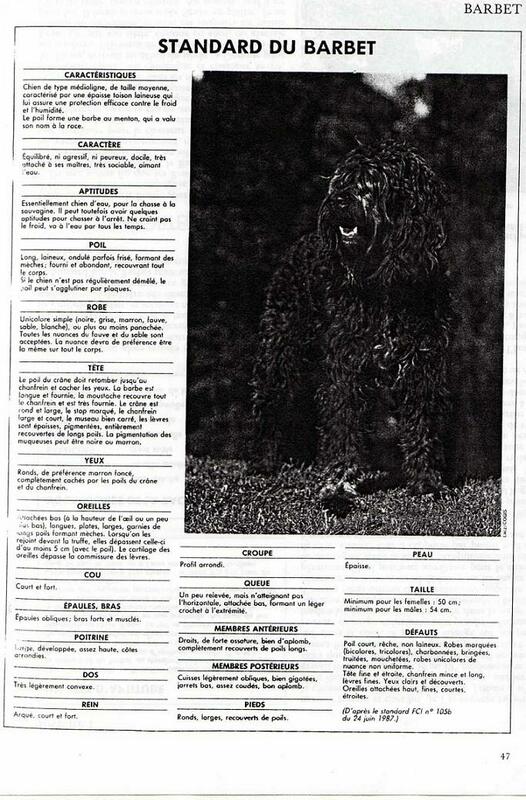 C'est une des caractéristiques principales de la race du Barbet Français. 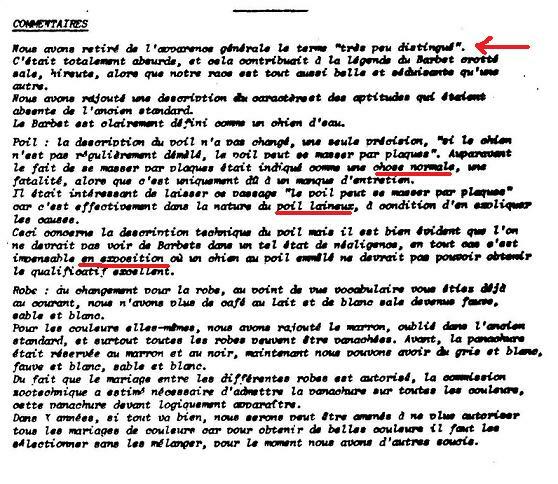 Ce document est tiré du bulletin du club du Barbet. One person took all the decisions concerning the breed. This is standard 307b of June 25th 1986. It was approuved in 1987 and couldn't be enforced before it got the go ahead from the SCC. In the mean time JCH drew up a list of non- confirmation points....in 1985. The size also changed here. And many dogs were refused confirmation even though that part of the standard had not been ok'd either by the SCC. The Zootechnical commissionof the French SCC has examined them but will only be approuved at their next meeting. The old standard stays until the modifications have been officially aprrouved by the SCC. Mr Hermans was heard by the LOF commission because so many complaints had been filed. In passing, any change in standard has to go through the club in a General Assembly before it goes to the SCC. AND it has to be recorded in the Minutes of the official meeting ... and be published in the club bulletin. That was not the case and still isn't.